Getting what you want isn't easy. Why? Because most of us have no clear idea what we're looking for a lot of the time. The key to being brilliantly persuasive and influential is knowing exactly what you want before you set out to get it. Irresistible Persuasion presents a process that you can apply to any situation: You choose your starting point and your goal, and then just join the dots. It's the only way to make success inevitable. 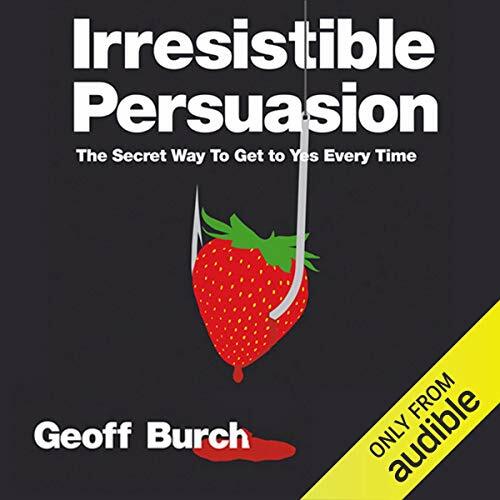 Irresistible Persuasion shows you how to entice people to your point of view, how to overcome resistance, how a bit of showbiz can go a long way, and why you should always consider the other person when you're negotiating. It's packed with new persuasion and influencing techniques as well as many powerful traditional methods. Geoff Burch is the presenter of BBC TV All over the Shop. When he's helped you to decide what you want, he'll show you the irresistible way to get it. You won't just get more customers; you'll get more profitable customers. What was most disappointing about Geoff Burch’s story? What character would you cut from Irresistible Persuasion? This was a basic book for a beginner sales person. Not at all what I expected. Cannot to listen to it! Would you consider the audio edition of Irresistible Persuasion to be better than the print version? Who might you have cast as narrator instead of Christopher Oxford? Anyone ..its sounds like Mr Ben. Really feel that I'm being treated as a child probably the worst choice and most condescending narration ever. Christopher please tone it down next time...this reads like a pantomime...sorry! This is a nice complement to another of Geoff's books, "Self Made Me", although you'll find that a few of the anecdotes are shared between the books. It's a little bit more "corporate" than Self Made Me and I made fewer bookmarks, but overall an interesting listen worth your time. Where does Irresistible Persuasion rank among all the audiobooks you’ve listened to so far? There are some very useful points in this, with an underlying foundation of common sense, and positive intent. The examples/stories help make it more tangible. It's accessible and the narrator's voice is easy and enjoyable to listen to- and he never sounds dry, pompous or didactic.